When my license plate finally arrived for my new car I was extremely devastated. Why would a Cougar fan drive around with a plate that clearly spelled U-T-E? Especially when the season is about to start in fifteen days, thirteen hours, seventeen minutes and six, five, four, seconds. This was a very serious matter, akin to my wife and children being in peril--which I technically take seriously. While driving home late one night, with the new license plate still wrapped in plastic lying in the passengers seat, I listened to my favorite radio station 1320 KFAN. 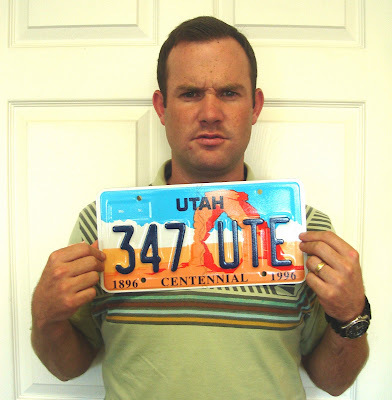 A guy called in from Utah County saying that he bought a new car two months ago and when his new license plate came it read 345 U-T-E. He was angry, he was mad, he was a Cougar fan. What kinda trick was Utah Country trying to pull? Was this a conspiracy? Did they know how many times I illegally jumped on to the grass at LaVell Edward's Stadium last year after so many sweet victories? So I called in the radio station and told them my story. They asked what I was going to do, which I replied that I was going to march right down to the DMV and get a new license plate. Then they asked, what if they won't let you exchange it? And then I had to wonder. And you know what Chup? That is when you came to mind. "He is here! The guy with the UTE license plate is here!" Then I was practically ushered to the front so that all the DMV people could shake my hand, have their pictures taken with me and ask for any ball-point-pen autographs. I am not sure how they all knew who I was, but suddenly I knew exactly what it was like to be Chup.